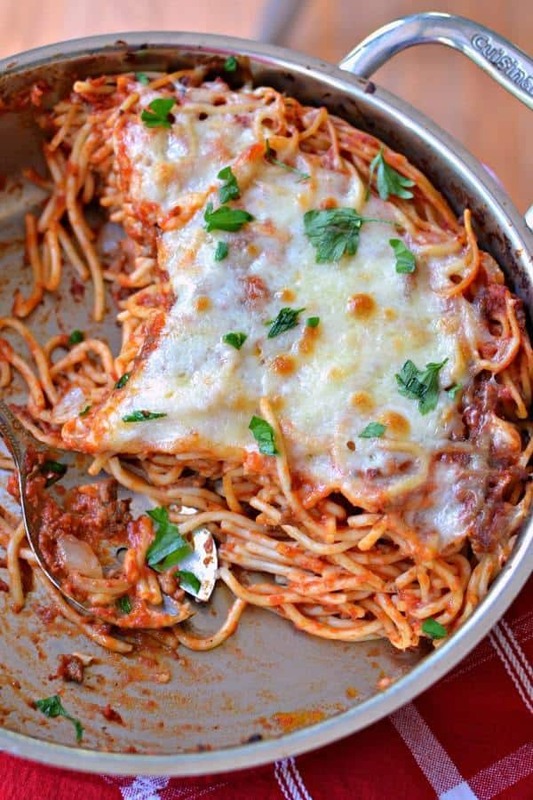 Baked Spaghetti Recipe is an easy family friendly meal that combines Italian sausage, marinara and mozzarella. It comes together quickly making it a feasible weeknight meal. Life is full of busy work and sometimes dinner just really needs to come together quickly. 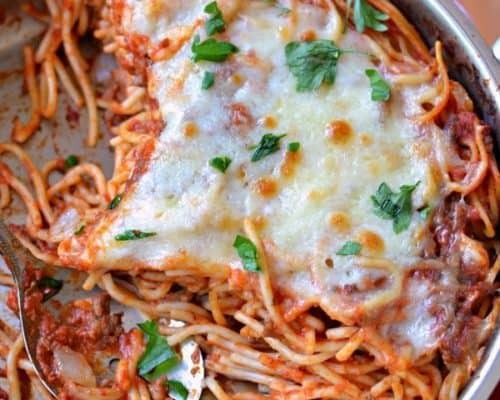 This Easy Baked Spaghetti Recipe brings it all together fast and still fills the requirement of a good wholesome dinner for you and your family. With the help of jarred marinara and Italian blend shredded cheese even the novice chef can handle this. 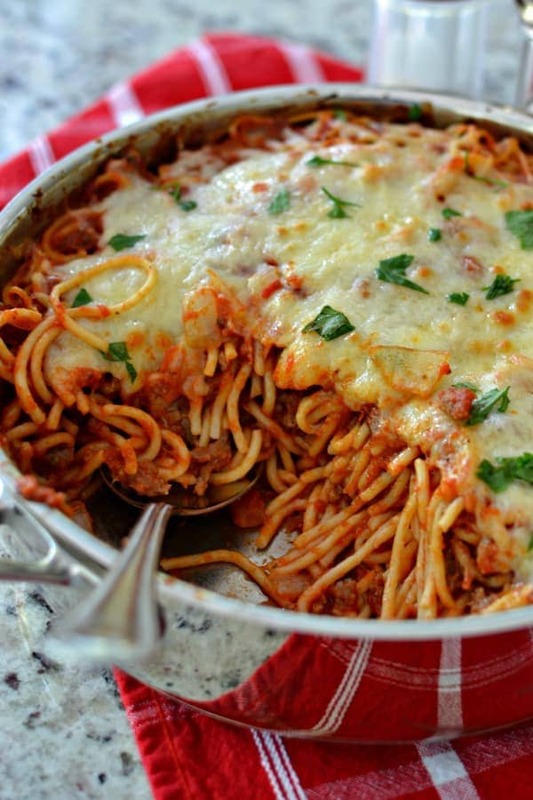 What to serve with Baked Spaghetti. However this pasta is a very filling meal so other sides are not required. I bet if your family is anything like mine than you have twenty things to complete in the next thirty minutes. This delicious recipe will put all that to rest in short order. How to make Baked Spaghetti Recipe. Cook spaghetti according to box instructions and drain well. Meanwhile in large skillet brown Italian sausage. Then add onion and cook until slightly softened and translucent. Then add garlic and cook for one minute. Carefully drain any excess grease from the skillet. After that step is completed mix in the marinara, cooked spaghetti and top with Italian cheese and bake. Top with fresh chopped Italian parsley and fresh grated Parmesan cheese after removing from the oven. Serve warm while the cheese is still gooey and melted. Other add in ideas for Baked Spaghetti. Diced red and green peppers. These would be added at the same time as the onions. Fresh sliced mushrooms. Add when the Italian sausage is about halfway browned trying to keep the heat up a touch so the mushrooms brown a little. Crushed red pepper if you like a little heat to your spaghetti. Add this right after the garlic and cook for maybe 10 seconds. Dried Basil and/or oregano. Add this at the same time as the garlic and limit it to no more than two teaspoons each. Crisp cooked bacon. Add this with the marinara right before topping with cheese and placing in the oven or sprinkle on the top after baking. Other delicious pasta recipes you will love! 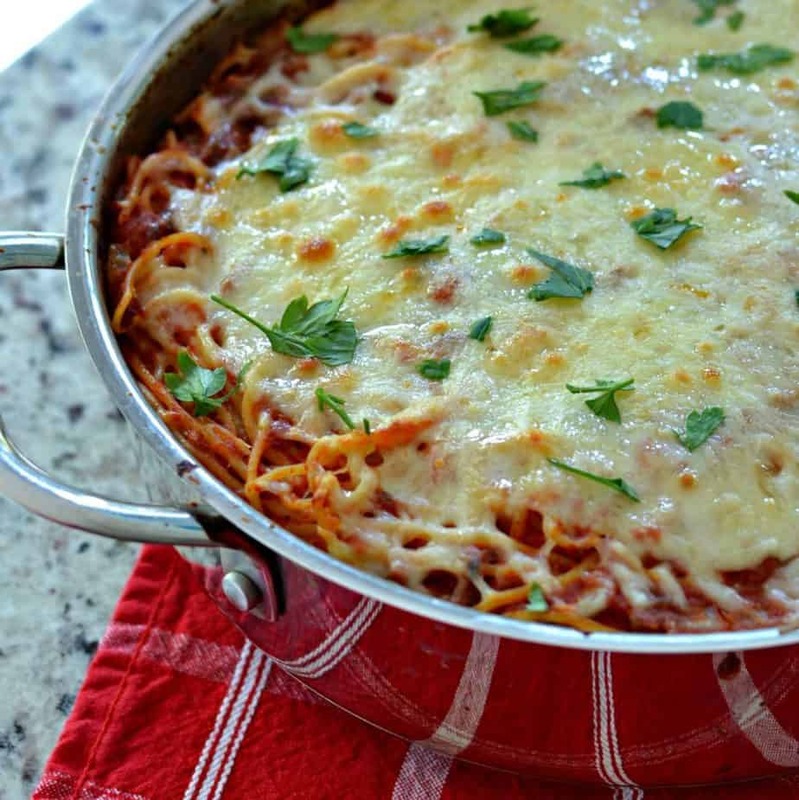 Baked Spaghetti Recipe is an easy family friendly meal that combines Italian sausage, marinara and mozzarella. This is a perfect weeknight meal. Cook spaghetti according to box instructions and drain well. Meanwhile in large deep ovenproof skillet over medium heat brown sausage. When sausage is almost completely browned add onion and cook for 4-5 minutes; or until slightly soft. Add garlic and cook for 1 minute. Drain any excess grease from the skillet. Stir in marinara. Add salt and pepper to taste. Stir in the cooked spaghetti and top with mozzarella and Italian blend. Bake at 350 degrees for 20-25 minutes or until cheese is melted and lightly browned. Top with parsley and freshly grated Parmesan cheese. Thanks Roger! We kind of went from summer to winter!